Steve Jobs was clear last year that he didn’t consider Siri a search company, but instead, an artificial intelligence company. But that doesn’t mean that Siri can’t serve as a threat to Google (s goog) on iOS (s aapl) devices. 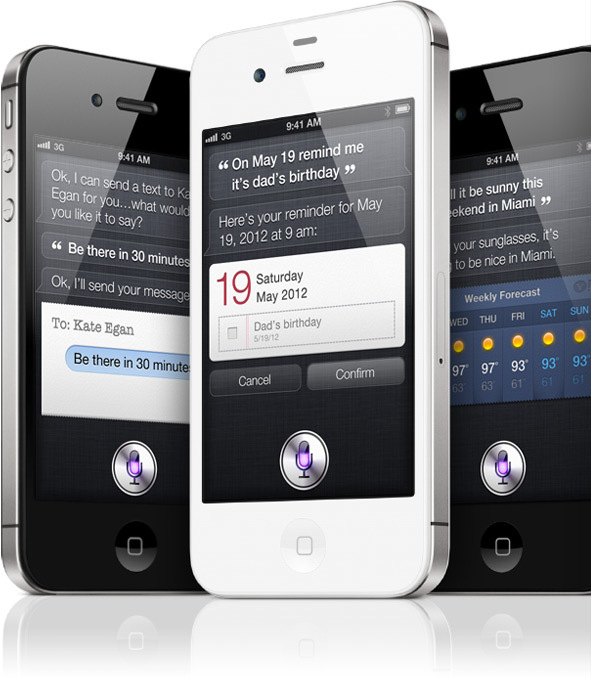 With the rollout of Siri on iPhone 4S, the voice-recognition and virtual assistant service is even more robust than when it first appeared last year before Apple bought the company. And it’s showing that while Siri isn’t search technology, when paired with other services including Wolfram Alpha, Wikipedia and Yelp, it has the potential to divert significant traffic away from Google and other search engines. Apple showed off how users can easily ask questions of Siri: anything from inquiring about the weather to getting definitions of words. They can also find restaurants and book tables if they need to — things that were available in original version of Siri. And with Wolfram Alpha integration, they can do more general web searches. Siri can also do things like set alarms, schedule appointments and dictate text messages: tasks that don’t deal with search. But in many ways, if users get comfortable turning to Siri, it could affect the amount of searches Google sees on upcoming iOS devices. Instead of turning to their browser and typing in a search, they might just ask for the information by voice. And in many cases, it could bypass Google altogether. Many of the top keywords for non-navigational mobile searches are for things like weather, which is number one; dictionary; and celebrity name searches, which can all be handled to some extent by Siri. With Siri, Apple doesn’t have to get into the search game if it can use Siri to direct people to the apps, services and information they need. That’s probably not a big money-gainer for Apple, but it could put a hurt on rival Google, which relies on search advertising. Google and Microsoft (s msft) have told me that a quarter of all searches on mobile devices are conducted via voice, so it’s not unlikely that people would get comfortable dictating searches with Siri. And if more apps can get connected through Siri, it would help them gain more visibility without having to worry about Google. That can be a boost for a company like Wolfram Alpha, which is trying to compete with Google in search. And it might also be helpful for a company like Yelp, which has to compete with Google’s own location services to get noticed in search results. It’s probably no coincidence that these two have signed on with Apple. I don’t think Apple is trying to simply put the screws to Google with Siri. But it seems like it would be beneficial to lessen the iPhone’s dependence on Google, something it’s expected to do with mapping at some point. And if Siri can provide a great front-end user experience, it could not only be a differentiator for iOS, but also help deprive Google of some search traffic. Apple could advertise against the diverted traffic, and that would be a nice byproduct for the company. Of course, people have to actually like Siri, and for many, talking to a computer-generated voice is still unfamiliar. But Apple is great at introducing people to technology. And in this case, it has a vested interest in pushing the advancement of Siri: It can deny some revenue to a competitor. Already google is a copy cat by using apples platform to build it android software. In this if they try to copy siri i guess its going to be a shame and no one would even be ready to use it. I imagine Google doesn’t make much money from these types of information/calculation queries (e.g. what’s the weather like, definitions, square root of 128, etc.). Google already answers many of these information/calculation queries directly on their site for free (i.e. you don’t have to click on an ad to see the answer). Google just answers these queries to build its brand and reinforce Google as the general answer engine in people’s minds. You still have to use Google for the regular web searches (where Google actually makes money). The only way I see Siri as a threat is that it may break the habit many people have of going to Google to answer every question. If Siri can be an attractive intermediary to answering questions, people may think of Siri (instead of Google) as the answer engine and Google can substituted with Bing, etc. for web searches. I wouldn’t trust Yelp if my life depended on it. They are not trust-worthy. You must pay to play in their scam. I think Siri is pretty much mocking IBM Watson. I should be fun to watch watson and siri match. Why does this have to be a threat. Voice search in Google is great! I would like to see an API however, so that other apps can use the platform. I don’t see how Google can offer a personal assistant in Android that doesn’t result in the display of advertising. And I don’t think consumers want that. is it sure you need internet connectivity for Siri to work even for just setting a reminder or doing a text/SMS reply? It’s obvious for doing a google/wolfram search etc. – but what about “local activities”? Internet needed too? If so: what might be a technical reason to not support Siri on older iPhones? i don’t think you need an internet connection to complete local tasks on the phone but it looks like you need the faster processor to do the work. That’s why it appears this isn’t available on older devices. Will update if i hear different. It is hard for it to be sweet if u have to hold the phone to the mouth all the time and press the button. It would be better if u can ask a question by pressing a button on the headset or allow user to enable siri before a roadtrip. As button/headset activation works already in the currently available voice recognition (play radiohead / call Susan) on current iPhone 4 (and 3GS?!) I’m pretty sure this will work with Siri similarlyâ€¦ or why do you think this won’t work? Very insightful post. I wonder what will google’s repsonse to this be. Also, in terms of AI technology, I don’t think there is a company that can compete with Google atm. Google is already building there own version of Siri, they been talking about about personal assistance for the past year, it only a matter of time before they unveil it, most likely next week. Siri is cool but these services to work need data well , they need lots an lots and lots of data, Google has more data than any other company out of the box. I don’t doubt that Google has more updates for its voice technology, which is great. And that will certainly shine on Android devices. The question is what kind of presence will it have on iOS devices? Siri, if it matures and catches on, gives Apple a way to have a go-to resource on iOS devices that people turn to first. That could be very powerful. > And if more apps can get connected through Siri, it would help them gain more visibility without having to worry about Google. Bingo and the execution ability to build a robust API developer ecosystem will be the key factor for success or perhaps not. Thanks for the comment. Yeah, i’ll be interested to see how Apple engages developers with Siri. That could open up its potential.